"Sometimes, an older person chooses a bowl of cereal for dinner because it's quick, easy, inexpensive, available and fairly healthy," said Sylvia Byrd, a professor at Mississippi State University. "Convenience, cost, ease of use and access are all major factors that influence food security." Physical and lifestyle changes also can play a role, said Byrd, a nutrition professor in the College of Agriculture and Life Sciences Department of Food Science, Nutrition and Health Promotion and researcher in the Mississippi Agricultural and Forestry Experiment Station. "Physical changes like a person's level of mobility can be a barrier to obtaining proper nutrition," Byrd said. "Additionally, something as simple as poorly fitting dentures can have a huge impact on an individual's ability to eat healthy foods." Growing old brings slowing metabolisms and changing requirements for nutrients, such as carbohydrates, proteins, fats, vitamins and minerals, Byrd said. Older adults must continue practicing healthy eating habits, which means maintaining a nutrient-rich diet that includes fruits, vegetables, dairy, grain, protein and plenty of fluids. Lifestyle changes also affect food security. "An event like the death of a spouse can have a tremendous impact on a person's cooking and eating habits," Byrd said. She said it is important for individuals to look out for the older adults within their communities. "It really comes down to being aware of that individual's need in your own community," Byrd said. "Does that older neighbor or friend have access to good, healthy food they enjoy, that matches their health needs, and suits their particular flavor profile? If not, what can you do to help them get the sustenance they need?" David Buys, an Experiment Station researcher and MSU Extension Service health specialist, echoed that sentiment. "Food insecurity among older adults is not limited to people who have lived in chronic poverty their whole lives," said Buys. "The concept of access isn't always based on economics." Buys said awareness is an important first step in helping older adults within a community who may be food insecure. "Be aware of the older adults around you. Don't simply assume they are fine," Buys said. "Older adults who may have been financially independent in the past are now living on fixed incomes. It may be as simple as making a little extra and taking meals to them. When you cook, cook a little extra and share it with the neighbor next door." Buys said this attention to older adults is especially important if those friends or neighbors have recently been hospitalized. Buys is studying programs for people returning home from the hospital. His research found that the health implications of food insecurity in older adults are considerable, especially for those who have been hospitalized for treatment of diabetes, hypertension and other chronic conditions. Buys said food insecurity increases these individuals' chances of returning to the hospital. "Poor nutrition is independently associated with hospital readmissions," said Buys. "Older adults who are nutritionally at risk and who have been hospitalized are likely to return to the hospital within 30 days. In many instances, patients enter the hospital, they lose their appetite, and when they return home, they don't bounce back to their previous eating habits like a younger adult may. That can put the patient in a downward spiral of decline." Buys is evaluating food delivery for patients discharged from the hospital. He also recommended services for older individuals struggling to keep food on the table. "Home-Delivered Nutrition Services—like Meals on Wheels, Congregate Nutrition Services and the Nutrition Services Incentives Program—are the three primary nutrition services of the Administration for Community Living, formerly the Older Americans Act," Buys said. 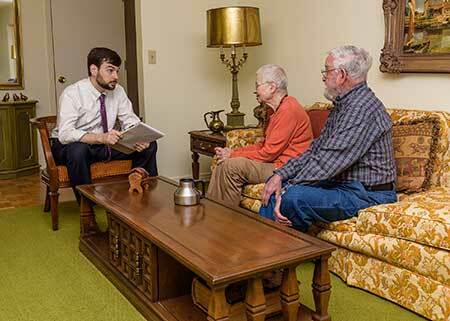 "Mississippi Department of Human Services coordinates the Area Agencies on Aging, which provides the Home-Delivered Nutrition Services Program in Mississippi." For more information about local services, call 800-345-6347 or visit mdhs.state.ms.us. Mississippi has the highest rate in the nation of older adults who experience some level of food insecurity, with more than 12 percent of Mississippians aged 65 or older considered food insecure.